Natural Elements Adelaide Fringe exhibition at the Hahndorf Academy in the Adelaide Hills. 17th Feb -19th March 2017. All works by Deborah Cantrill. For those who could an not make it, enjoy this snapshop of the exhibition. Weavers; iris, chestnut root bark. When leaves loose their green vitality the edges begin to fold inwards as they fall to the ground. This carpet creates a fascinating array of shades from green to black ,of curled up contorted shapes and a variety of dry paperery textures. It all starts with a seed, with its memory of the past and its potential for the future. Twined Hanging basket.Frame;bookleaf pine,cordyline. Weavers;iris.Wooden beads. Rib basket construction. Frame;bookleaf pine, willow. Weavers;Iris, NZ flax,iris/fique 2 ply. Eyes: stitched 2 ply chasmanthe. Legs: Fruit tree prunings. Starter rewind spring, telephone wire, pine sticks. 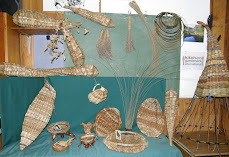 Rib basket construction, Frame; Willow, Bookleaf pine. Weavers; Abyssinian banana, fique.